Southwark Council has commited to build 11,000 new council homes by 2043. The site at Bells Gardens, including the Community facility, the garden, the ball games court and play area have been proposed as part of this development project. 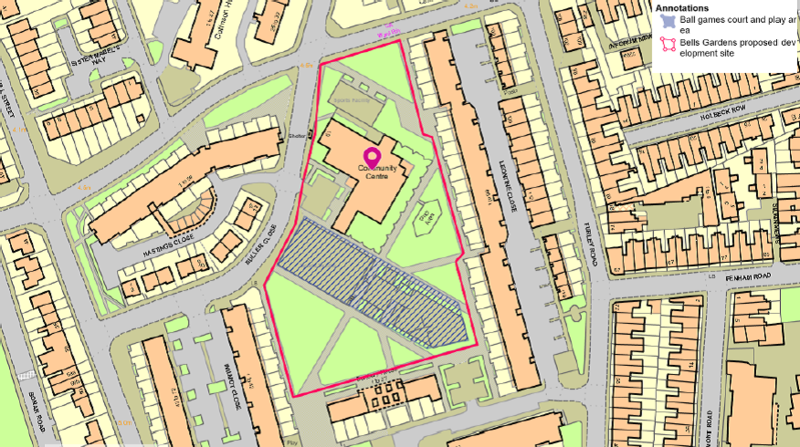 We want to know from people who live in the Bells Gardens, Lindley or Oliver Goldsmith estates how the ball games court and play area (blue in the map below) are used and how you think they could be used in the future. Your feedback is very important and will be used to develop the plans for this site. For any further information abut the project, please contact Helen Laker, New Homes Engagement Officer helen.laker@southwark.gov.uk, telephone 020 752 50848, or for online information and feedback about the ball games court, the play area, and the new homes search for www.southwark.gov.uk/bells-gardens. We want to hear what you think about the ball games court and the play area. Your feedback is very important and will be used to develop the plans for this site. Please spend a few minutes recording your comments here. The council began the new homes consultation with a drop-in event which took place on the 13 February. At this drop-in event residents had an opportunity to meet the project team and architects, discuss what it is like to live in the area, share ideas about the design boards (see here) and find out what will happen next.